Are enterprise businesses lagging when it comes to inbound marketing? You might think so given that most content marketing examples tend to come from little startups or the usual set of consumer brands. Yet, the reality is that large enterprises are deeply engaged in inbound marketing. In fact, according to the Content Marketing Institute’s 2013 Benchmarks Report, B2B enterprise companies (1,000+ employees) actually use more content marketing tactics than their smaller counterparts (on average 16 compared with 12). Moreover, enterprises aren’t just excelling in quantity. Over the past few years, a number of large enterprises have been creating interesting, high-quality content that is both innovative and on-brand. 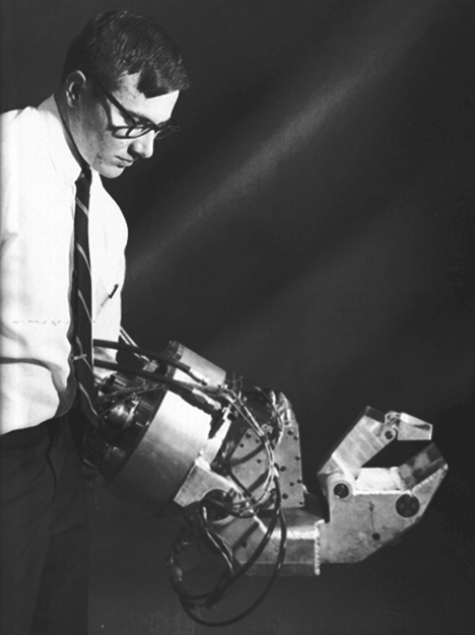 How do you get people interested in research that covers everything from jet engines to industrial lasers? By creating a content-rich Tumblr with bold visuals and engaging copy. GEReports is successful in large part because it doesn’t take itself too seriously. There are plenty of animated gifs, inside jokes, and even headlines with a clear TMZ-influence (“OMG! Super-Resolution Microscope Shines Light on Superbugs, Cancer and Drug-Resistant Slime”). 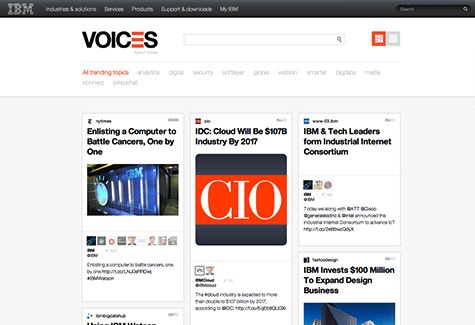 With Voices, IBM shows that “curation” is much more than a popular inbound marketing buzzword. This simple site provides value to Big Blue’s customers by aggregating content from reliable sources in a clear, single-page format. Rather than try to be everything to everyone, the site focuses on only a dozen topics, which makes it both focused and easy to navigate. 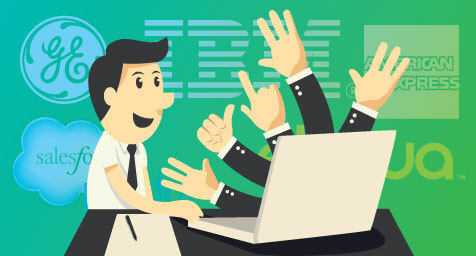 Moreover, each vertical aligns with IBM’s core offerings, providing lots of opportunities for establishing expertise. Often, businesses try to capitalize the current zeitgeist by piggybacking on trending topics and events. Unfortunately, these efforts usually fall flat since the connections often feel artificial. 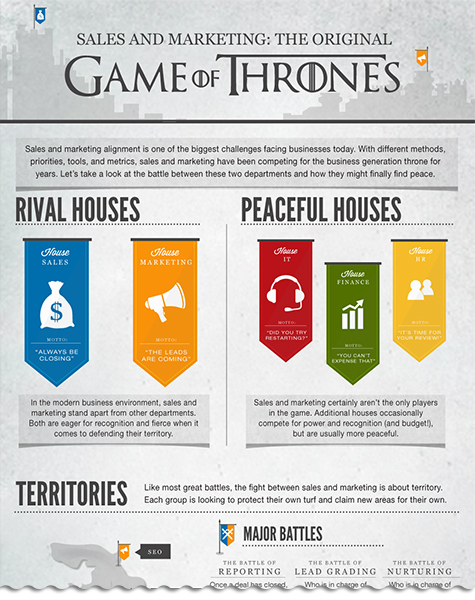 However, last year Pardot, a marketing automation platform owned by Salesforce, showed how a pop culture reference can be done properly with its popular “Game of Thrones” Sales vs. Marketing infographic. Why did this particular piece of content work so well? Largely because the comparison between the show (warring families) and the business problem (warring divisions) felt authentic, not forced. Moreover, the creators showed a firm understanding of both the television series and the target audience’s workplace issues. At its core, inbound marketing is about establishing a relationship with consumers. 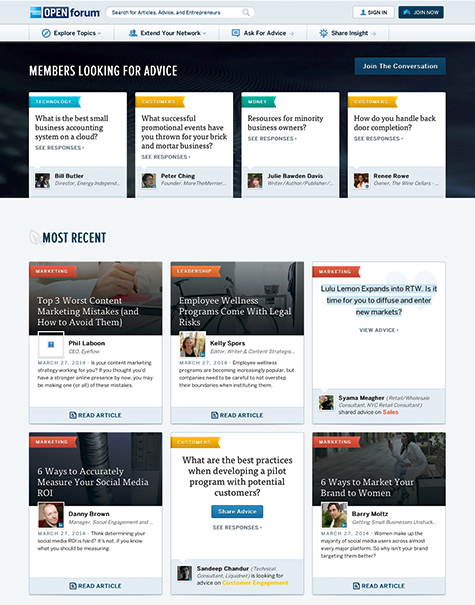 AmEx does this extremely well with its OPEN forum, a platform where entrepreneurs can seek and give advice. The offering is effective because it is extremely useful. Rather than bombard consumers with offers, AmEx instead provides true value to small businesses. By creating a space where entrepreneurs can share their thoughts, the brand builds trust (and affinity) with a very valuable audience. What’s harder than introducing a new product? Introducing an entirely new product category. Oracle Eloqua faced this challenge a few years back when it needed to roll out a revenue performance management platform, something that didn’t exist in the market. In addition to using traditional methods to explain things, the company also created a YouTube video that put the new offering in context of other financial advancements. It’s not the funniest or wildest video in the world, but it doesn’t need to be. Rather than going for flash, the content instead takes the time to smartly and clearly educate a very specific group. Ultimately, that is often the key to effective enterprise inbound marketing: walking the line between being entertaining, and building trust with a sophisticated audience. It’s not easy, but as these examples show, it is possible and can be highly effective. Learn how inbound marketing can benefit your brand. Contact MDG Advertising today at 561-338-7797, or visit mdgadvertising.com.